The Millington Industry Audit effectively captures the evolution of your industry from where it was to where it is today, detailing the current state as it affects your business strategy. As the industry changes, strategies must be adapted and modified to take advantage of industry gaps to develop a sustainable edge over competitors. Understanding the industry landscape provides insight into competitive parities to develop operational efficiencies and shift the company's focus to greater market share opportunities. Based from the Millington Model, a strategic facilitation approach used successfully with over 90 clients, our model leverages the synergy between industry experience and academic best practices. Composed of four major stages, the Millington Model best understands the competencies of the company, the industry, and tests and values the strategic options that leverage and mitigate the existing attributes and factors of the company and environment. The critical component includes the thorough development of tactics and SMART objectives that support and ensure the strategies are accomplished and successful. Where/who/what is the firm now? Where will the firm be in X years? Through a multi-phased approach, the company's previous strategic planning exercises and documents are leveraged and a gap analysis is performed with our Millington Model. Some strategic plans perform excellent, positioning the company for success; while many others fail to incorporate the necessary strategic plans into day-to-day business operations. Our Millington Model will understand and detail those gaps with clear positioning at the conclusion of the process where improvements are required. The approach includes positioning your company using a gap analysis to the key core and distinctive competencies of your chosen peer group within the industry, thoroughly details the political, environmental, social, technological, legal, and economic environments, and provides insights into your key competitors. A snapshot of your current company-wide and operating unit strategies forms the basis of an evidence-based gap analysis in the industry. Detailing and testing the company's current strengths and opportunities, and weaknesses and threats to the previously developed strategic plan is a critical component of Phase 1. This understanding generates the gap analysis and details the link between your current plan, your competencies, and your tactics to realize that strategic plan. Partners, suppliers, collaborators, consumers, and internal resource groups extend to form the vertical value-chain of your company. Understanding the positive and negative interactions between these groups and your company provides vital insight to measure and test your strategic plan. Information from the strategy and value-chain audits is tested with the Millington Model to detail gaps with the current strategic plan. 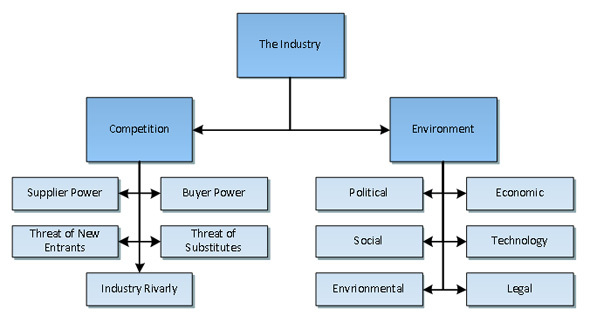 The current state of the industry is detailed using Porters 5 Forces and PEESTL Analysis tools. Using a chosen peer group, Porters provides insight into the competitive aspects of the industry. PEESTL details the political, economic, social, technological, environmental, and legal aspects of your industry with respect to the chosen peer group. This research phase helps understand the core and distinctive competencies of the industry to be used in Phase 4. Information from this phase also provides answers to competencies that your industry peers compete on. With collaboration from the company and previous research, a list of competencies is developed that may include critical industry comparators, or provide insight into the competitive market. 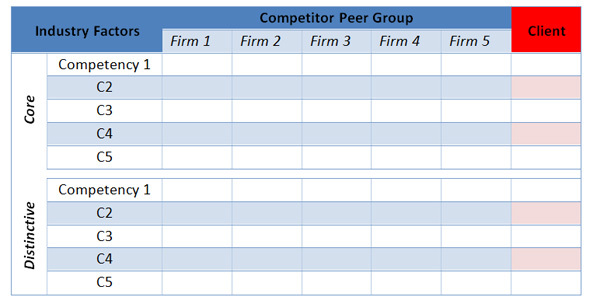 A peer group of competitors is selected and the competencies developed. These include the core and distinctive competencies of which the competition and industry compete on and how the company is positioned in comparison. Gathering information will come from a balance of secondary and primary research, such as posing as mystery shoppers. Information from this phase will help supplement data obtained from Phase 2 and form the basis of the gap analysis in Phase 4. Using the Millington Model, core and distinctive competencies of the industry will be tested and measured to understand their value and linkage to the previously developed strategic plan. A gap analysis is performed based on the obtained market research and industry competencies in relation to your set strategies. The strategies you have developed may not require any modifying: they are properly developed to adapt and meet the demands of the changing industry. Some strategies may be flagged for a suggested further review, based on identified gaps uncovered throughout the previous phases of the audit and tested with the Millington Model. Discovering the gaps and disconnections between previously developed strategies and the industry and company's operating environment is critical for repositioning the company for success. The Millington Model is leveraged at each phase to audit, test and compare the company's plans to the actual environment. Using the Millington Industry Audit is an unbiased approach to understanding how your company and your strategy compare to the industry environment. As the industry changes and greater opportunities are identified, your strategy must be flexible to change with it and pursue new areas.